My cake decorating journey began over 5 years ago while I was in grad school. I took all 3 Wilton courses. Since that time, I’ve decorated quite a few cakes ranging from small birthday cakes to 4-tier wedding cake and everything in between. Although I was trained using the Wilton method, I’m not a huge fan of their fondant icing (the pliable icing that resembles play-doh) as I’m completely turned off by the odor and taste of it. I have recently stumbled upon a wonderful recipe for marshmallow fondant that I can make in the comfort of my own home. It works just like the Wilton fondant without the nasty side effects. I also make my own buttercream icing! Shown below is a general guideline for cake servings to assist in determing what size would best fit your need. The serving sizes are also approximations (cake servings will depend on the size the server cuts). These sizes are slightly bigger than the Wilton guidelines to allow for more generous portions. This chart assumes that each cake is double-layered with frosting nestled in between. 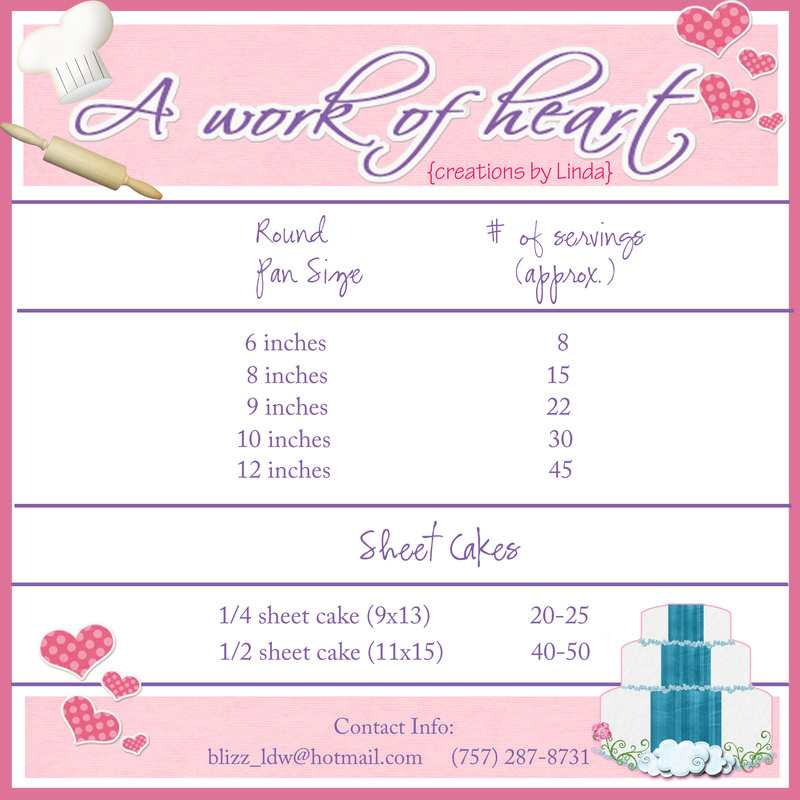 The servings assume each piece is cut to 1.5 x 2 x height of cake (usually about 4 inches), which are slightly larger than standard servings pieces. I enjoy the challenge of making different kind of cakes. 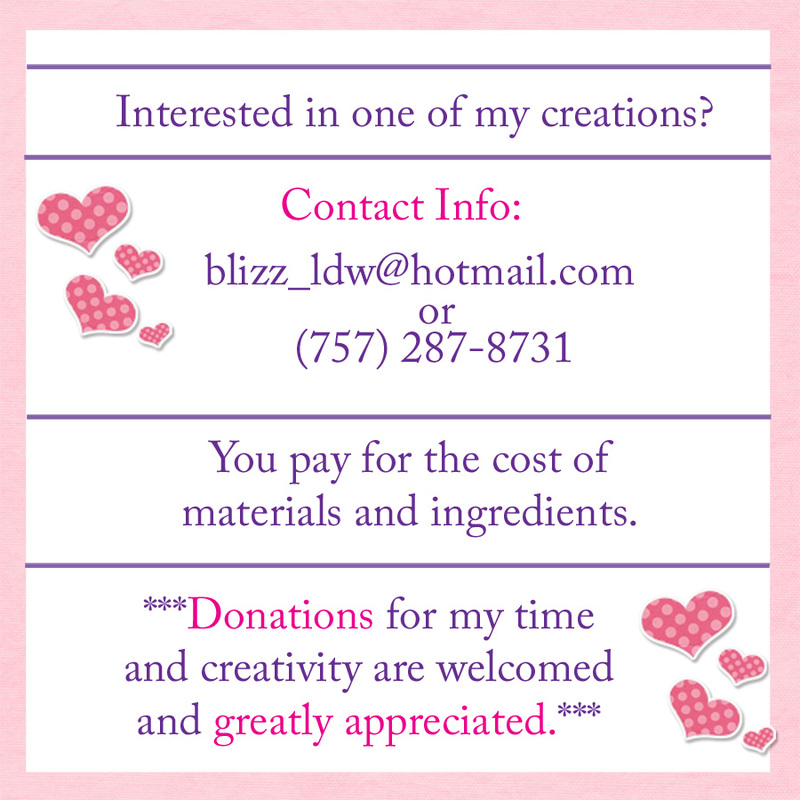 If you are interested in learning more about my cakes or have any questions, please email me at: blizz_ldw@hotmail.com or call me at (757) 287-8731 and I’d be happy to discuss it with you. Here are many cakes that I’ve made (including the ones I made while I was taking cake decorating classes). The pictures are arranged in order, beginning with the most recent. Lovely site, Linda! We loved our wedding cake. Not only was it delicious, but it was wonderful to look at and so very unique! Thank you again for making our big day super special and super… “Stitchy”! Aloha! Thanks Valerie!! I really enjoyed making the wedding cake for you and Corey and I’m happy that you liked how it came together and tasted. It was a lot of fun to create, for sure! You’ve really come a long way but I just wanted to let you know (yet again) how amazingly talented you are, I’ve seen many a cake in my time and am in awe of your work, you need to charge a lot more, and come to Charlotte too 😉 Best wishes you awesomely talented woman! Thanks Jennifer! You’re so sweet! Believe me if we lived closer you know I’d create a cake for your girls!